Finally… it all makes sense! 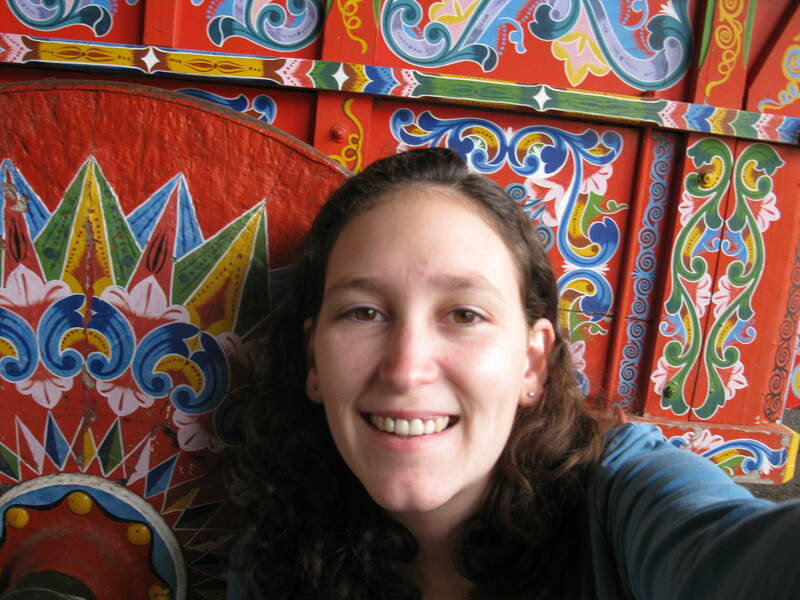 In the summer of 2008, on August 1st, a group of people from the church i attended in high school (myself included) landed in San Jose, Costa Rica to begin a 10 day mission trip in a small town in the South of Costa Rica. We stayed the night in San Jose & headed out on our way on August 2nd. (If you know much about Costa Rica, i’m sure you are already laughing at this post. If you dont… then let me explain.) A drive that would have usually taken us 5-6 hours on the PanAmerican Highway took us about 12 hours to make. Why? Well, on August 2nd every year, a large part of the Pan American is closed for a religious fesitival that i did not then understand. At the time I understood it to be a day when everybody walked because it was the holiday of the patron saint of walking. (I was close… kind of. Actually, not at all. But it does involve walking & the Patron Saint of Costa Rica). I have spent the last 3 years in the dark about this whole thing. Until Today. 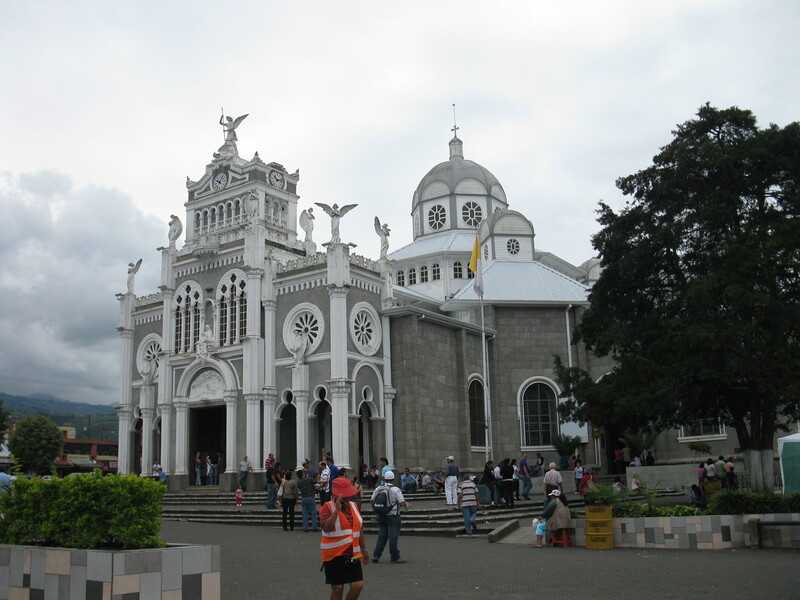 Today our group took an excursion over to the Cartago area of Costa Rica, and we stopped at the Basilica of the Virgin of the Angels. This is the spot where a young indigenous girl found a statue of the Virgin Mary on a rock in a field. When she took it home and came back the next day, she found it again. She decided to take it home with her and compare it to the one she had found before. When she got home, she found that one of them had disappeared. When she told her local priest about it and gave him a statue as well, he thought nothing of it until he found that it had also disappeared–only to be found on the same rock in the same field. The priest decided they needed to build a temple to the Virgin in that spot, and after many revisions and earth quakes and etc, this is what is there today. Ok. So now we understand about the patron saint thing. But what about the walking? Because of the miracle of the reappearing statue and the strong belief in the power of the Virgin to work miracles and heal, many people from all over the country (about 2 million last year–in a country about only about 4.5 million) make the pilgrimage from their towns to San Jose and then from San Jose to this town which is about 22km away. Guess what day that happens??? Yep. August 2nd, every year. And there about so many people who do it, that they have to close the highway. This is the inside of the Basilica… it is beautiful! “Pura Vida” –of course i have to mention this one. “Pura Vida” is the national motto/ catch phrase of the country. “How are you?” “Pura Vida” (great). “I like these your shoes” “Pura Vida” (thanks) ; “We just won a million dollars” “pura vida!” (That is awesome). In other words, “Pura Vida” is a versatile phrase that hints at the essence of the Tico. It is literally translated, “Pure life”. Imagine an entire country whose phrase is, “Pure Life!” “How are you today?” “Pure life!” Simply amazing. “Con gusto” vs. “de nada” — Here in Costa Rica when you say thank you, you might be expecting the person to return the gesture with a “de nada”… but here the people say, “Con gusto” or “with pleasure”/ “my pleasure”. “No vale la pena” –I dont know if they say this in other places or not, but i love it because my host mom always says it. It means, “its not worth it” or “its not worth the pain” or even “its not worth the money”. Very interesting and useful little phrase. “insecto” vs. “bicho” –so a few years ago i found out about the issue that some countries have with these two words. In some countries (like Costa Rica) it is common to hear people say, “hay un bicho allí” which means “there’s a bug!” In some other countries, however, the people only use insecto or the name of the bug because “bicho” is used as a vulgar slang. Be careful! Well, if you know Spanish, you know that that title means “Hey you Ants!” If you don’t know Spanish… now you know how to say that. My host mom and I were talking over dinner a few nights ago, and because the houses here are mostly “open air”… there are often a lot of bugs–including ants. I dont like ants; they give me the “creepies”. She started telling me how a friend of hers gathered up some ants a few years ago and gave them “a talking to” about how she didn’t like them in her house, eating her food… etc. She gave them an amount of time to leave the house, and told them that she would start poisoning them if they weren’t gone by then. This then prompted me to gather up some ants of my own. They didn’t seem to be paying attention, so I began yelling at them in the kitchen and letting them know just how this “Ant vs. Human” thing works (in Spanish of course). After about 5-7 min of this, i looked up at my host mom, and we just busted out laughing. This was possibly the most hilarious and strange use of my Spanish skills yet. Only in Costa Rica. “yesterday morning i woke up and made preparations to take a shower. as i undressed and stood next to the shower, with my hand in the water, i realized that it wasn’t really warming up very much at all. i stood there for almost 15 min before i finally decided that i needed a shower, and it was going to have to be a cold one. i stood there under the cold water, livid and pouting. i was livid because i pay to live in a dorm that is supposed to have hot water. i hate cold water. with a passion. i’ll go to the beach and never even dip a toe in the water b/c i hate cold water that much. i dont even order ice in drinks. So then. i shut off the water and the thought occurs to me: “what about the people all round the world that have to take cold showers every day?? or the people that don’t have water at all? ?” wow. reality slapped me in the face. I have been to a place like that. Costa Rica. we took cold showers every day. 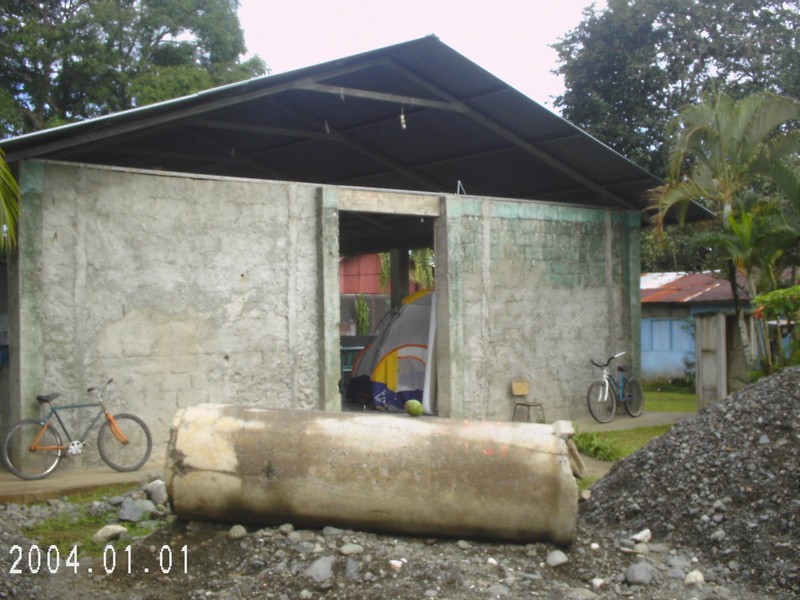 in fact, most of the people in our little town that we went to didn’t have showers at home, they used the spigots that came out of the side of the churches walls and put up tarps to take their cold showers. wow. even a cold shower in one of the nicest places i’ve ever had the privilege to live seems like something i dont deserve. why? because i dont. those starving kids in Africa or poor families in Costa Rica or abandoned children in China aren’t any less human than i am. yet i have a million times the resources that they do. In sharp contrast to that experience, i am living and studying in the most developed part of the country – the San Jose area. In addition I am living iN a beautiful home in a safe and nice neighborhood. It is so weird to me to have lived in and experienced both extremes in this country. Unlike my experience on the mission trip, I take a hot shower every night and I use the Internet to Skype with my husband almost daily. I don’t believe that costa rica can be called a third world country by any stretch of the imagination, and since the term “second world” is reserved for Communist countries, I feel that maybe costa rica can be called a 1.5 world Country. A large number of the people living outside of the metropolitan area live with out running water and electricity . Many times the houses “del campo” are simply a room without a conventional kitchen or bathroom– and at the same time, an increasing number of people have access to the internet and are becoming “middle class”. The country offers socialized medicine (think what you will about that, but without a military to spend money on, it is a little more practical for them than us), universal education (with a literacy rate of 98%), and a social security system that (without must digging yet) seems to be without controversy among the people. It is so important to me that I have been able to see an experience both of these extremes-and that through and understanding of the rich history, geography and culture of Latin America – I am beginning to understand it a little more each day. Born in Moscow to German speaking parents, she grew up speaking German at home and learning russian at school. At the age of 14 she moved with some of her family to France where she continued her studies in French and began learning English .she married a French man and after ten years of marriage they moved their family to costa rica- where she has lived for the last thirty years. I feel like she is an excellent representation of the diversity of this place. People come here from all over the world – the US, Europe , and all of the Latin American countries looking for peace & pura vida. Despite her diverse up bringing, she is Tican in the truest sense of the word. I haven’t figured out yet how to describe what it means to be Tican, but i will be looking for words to write it out over the next few weeks. On Thursday, we didn’t have class so we headed to the institute we are studying at to exchange money for the weekend… But they had already left. So Courtney and I left on an adventure to find a bank that would exchange some money for us with on a copy if our passports ( since we were advised to only carry copies ) . The only banks that will do that are private banks here because their riles aren’t quite as strict. Going to the bank here is a lot different than in the united states… They are very secure, to say the least. Guards stand outside with big guns; if you want to get in, the guard will give the guy inside a nod to let him know to unlock the door and let you in. Once inside, we had to take a number and wait… It was tense. I felt so tense bc of the guns. in the morning every monday and wednesday i have a film class. Yesterday morning, we watched a movie called “Sin Nombre” –about illegal immigration and the gang problem in Mexico. It showed in depth some of the paths people take to get into the united states (things i would have never thought of) and it describes the gang culture in depth as well. Both of these things are terribly sad, i can’t even describe it. The movie was so graphic and real (not hollywood-esc at all) that im sure they would not have been able to show it in theaters in the US. An “R” rating would not have been enough. For me all of this is horrible but even more tragic. It is the tragedy of choice for a lot of people. If they aren’t immigrating illegally, they may be choosing to let their family suffer. If they are choosing to immigrate illegally, they are putting themselves in danger of death, getting caught and taking the risk of never seeing family members again. In many areas of Mexico (especially) if a young man isn’t in a gang, his area is certainly being controlled by one. In the midst of all of the tragedy that our class had trouble wrapping our minds around, our next class decided to go to a museum instead of class at the last minute. So, 21 of us got on a city bus and “gringoed” our way to the national museum of Costa Rica. We walked up to a beautiful building that actually used to be a major fort in the San Jose area. The people and government here are so extremely proud of the peace they have in their land and with the world. Anybody will tell you that they have no standing army in a heartbeat. While they are proud of their history, they are even more proud of their present. They turned their old fort into a museum, but not just any museum… about half of it is actually a Butterfly Sanctuary. (Costa Rica has one of the most diverse and beautiful butterfly populations in the world…) Wow–what a testament to peace. In the US, we turn our forts… into forts… and get re-enacters to come out and pretend we are at war again. anyway, i have some hours to kill… it is only 6:30 here, lol. It seems like every day, my roommate (courtney) and i manage to get off at the incorrect bus stop. This means that 2 days in a row, we have taken adventures… off the beaten path… so to speak. And as a result, we have done extensive amounts of walking and asking for directions. I think we are pros at both now. I am also gaining awareness of how far it is when someone tells you to go “200 metros” … lol. On from that… Yesterday Courtney and I took a bus to the downtown area of San Jose (speaking of buses, talk about a NATIONWIDE public transportation system that EVEN RUNS IN THE RURAL AREAS and is excellent. –the secret? government set routes with privately owned buses and companies contracted to run them. They even set their own bus fees…hmmm.) 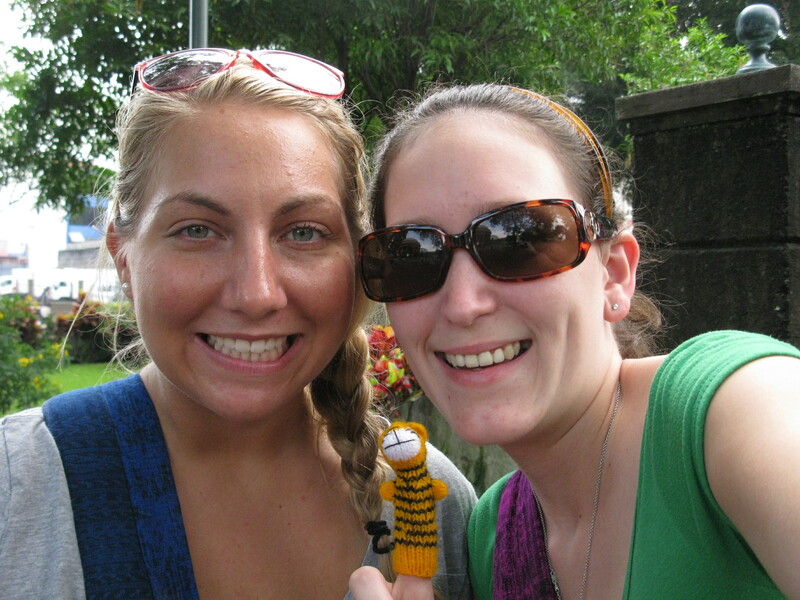 We walked around a beautiful park and found a cute little market–where i bought a finger puppet tiger that the lady in the story helped me name “juan el tigre”. i have a lot to say and not so much time. ❤ but i love it here! Yesterday was a long and beautiful day 🙂 Our group woke up early and met at 7am to get started on our way to the Poas Volcano. Before we left, our host mom fixed us a huge breakfast of peanut butter toast, chocolate coco puffs and a whole sliced mango for each of us. (She has clearly had American students stay with her before) Since yesterday was a sunday, the roads were entirely abandoned (meaning it is the one day of the week that it is safe to drive in this country…). On our way up the mountains our guide explained all kinds of things about this country, its culture and its history. Because Coffee has played such a huge roll in the development of the country, we stopped at a coffee farm. We then had breakfast #2 for the day… which was a traditional Costa Rican breakfast of Rice and Beans with eggs over top, Costa Rican Coffee, and fruit on the side. After that, we got to learn how coffee is grown, harvested and roasted. It was really neat. After that, we got back on the bus and headed the rest of the way to Poas. Because of the elevationthere the mountain is mostly covered in cloud forest, meaning that clouds are often covering the view of the volcano. Once we walked up to it, we weren’t able to see it, which was kind of sad, but it was really need to be surrounded by cloud. 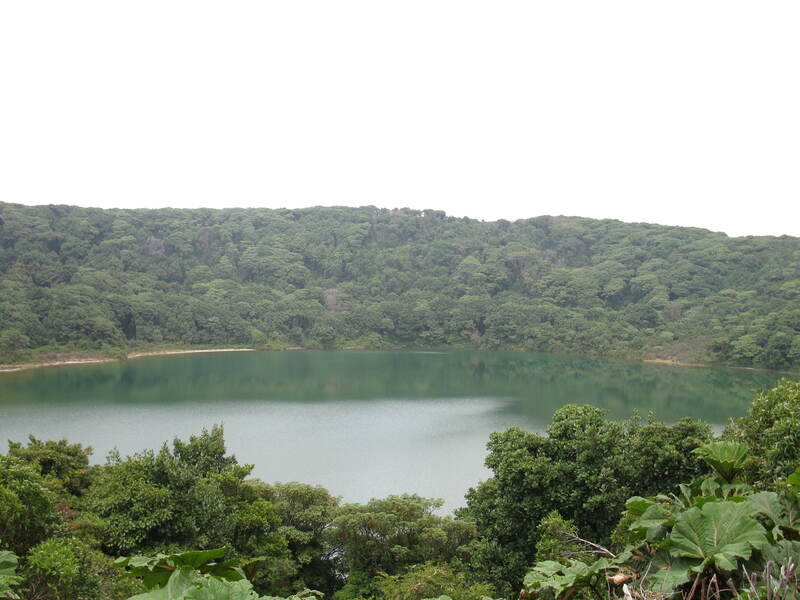 Besides the main crater, there is also an extinct one at Poas that is filled with rain water now. To get to it, you apparently have to go up a “steep trail”. So, most of our group decided to climb it, myself included. Wow. Steep was no lie. We were so out of breath when we got to the top! It was definitely a testament to the fact that us Americans are entirely out of shape When we got to the top, it was beautiful. After we had all forgotten what a task it was to get up the mountain, we decided to take a different trail “down” it. We were told that it is really steep down hill, and to be very very careful. Well… it was down hill for sure, but the first half of the trail was incredibly steep uphill, and quite a challenge to climb. We were so happy to see the down hill part begin, until we saw how down hill it was. Let’s put it this way… if i weren’t in genuine fear for my life coming down that mountain… there would be pictures to prove it–but i was too scared to get my camera out and take my hands off the railing. lol. It was an adventure for sure. About the time that we were heading out of Poas, it began to really rain. I have learned a few things since being here about the climate. I thought t hat i packed enough jackets. In fact, i thought that i overpacked jackets. I was incorrect. I have been cold since i got here (and i am thinking i will be buying another jacket soon…) The elevation makes it really cool here, especially since it is the winter/ rainy season here in CR. So as it began to rain, we headed out of Poas and into another conservatory/ park near by. There we got to see several of the animals that are native to this country. I was 2 feet from a poison dart frog with no barrier in between. and 12 inches from a Tucan. It was awesome! We had a buffet lunch there, were i proceeded to overeat. Yum. 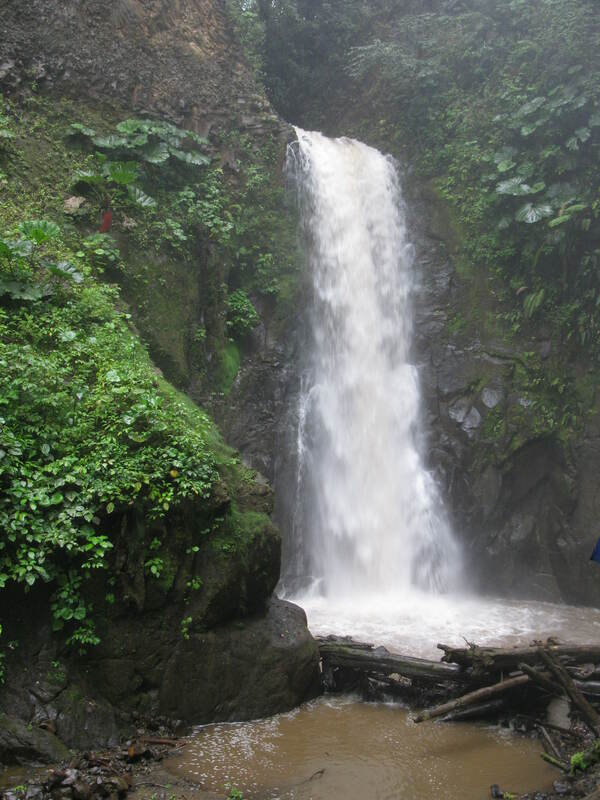 After we saw the animals, we began the trek down the mountain we were on towards a two waterfalls. They were beautiful! P.s. i forget to mention something awesome: at the last park that we went to with the waterfalls, our group ran into and got pictures with Billy Ray Cyrus. 🙂 I touched him! lol. Anyway, it was really neat and random, and while the pictures aren’t on my camera, there is proof on someone else’s camera! Ahora estoy in Costa Rica 🙂 For the sake of all my readers, i will make this one of my few english moments for the day. After a night of hard-core packing & and a day of airports, layovers and flights… I am finally here. Its a hard thing to try and explain–but every time i come here, I have an overwhelming sense of coming home. I feel like this place is full of the juxtapositions that make my passion for the Spanish language, this culture and its people so intense. Our plane landed surrounded by fog covered mountains in one of the most beautiful places i have ever had the privilege to see. Our bus drove us from the nice houses in the “suburbs” outside of San Jose, passed the shacks of their neighbors and into a city ridden with culture and flowing with crime. I’m staying in one of the nicest houses in this area (it is BEAUTIFUL. pictures to come) …and at the same time, i’m in the same country that i have come to serve in mission trips twice. I know that the situation i described is everywhere. Its in Tampa, New York… everywhere. But for some reason it tugs my heart here. Such a beautiful language that expresses such a beautiful culture that happens in the midst of prosperity and poverty and politics. I’m sincerely in love. My host “mom” is pretty amazing. Honestly, i will have to find words to describe her in my next post, but as for now, let’s leave it at “amazing”. this is truly amazing. everything is so beautiful.